Renowned as one of the greatest explorers following the advent of Drift travel, Jelev Rasheen left behind a legacy of adventure and exploration, not to mention countless alien relics, technologies, and treasures recovered from her travels. Her disappearance in the Vast, along with rumors of her final treasure fleet, has inspired adventurers for centuries. Now Radaszam, head of the Acquisitives faction, has uncovered a lead on Rasheen's last journey into the Vast, and he wants the PCs' help in finding what befell Rasheen. A treasure hunt for a treasure map! 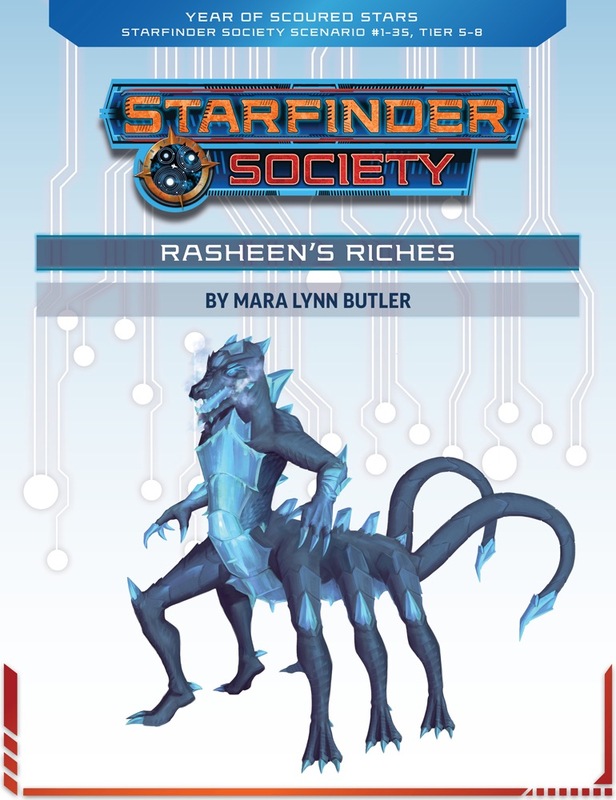 Rasheen’s Riches sounds at first like a classic treasure hunt — in space! Which is only partly true. Its more accurately described as a treasure hunt where you’re aiming to find another piece of the treasure map. As long as this is clear to your players by the end of the mission briefing (which it should be) you won’t have a problem with any players feeling let down. However, if players think they’re off to find unimaginable riches they might be a little disappointed. I know my kids would say “That’s it? But where’s the treasure? !” Be sure to adjust those expectations a little. Haha. I enjoyed this scenario. It’s got some environmental challenges to overcome, an interesting investigation, illuminating player handouts, and a battle against some tragic enemies. It’s got an air of a mystery about it, which I liked. I absolutely adored the descriptions of this moon. The entire atmosphere of it — and the creatures that you encounter there — worked really well together. Definitely a highlight of the scenario for me. The starship combat was straightforward but enjoyable. I like the social encounter it begins with and the artwork of the ship! It looks like some kind of skeletal Batplane! Overall I thought this was a really solid scenario that will — hopefully — lead to further adventures on the hunt for Rasheen’s riches! "I hope it's not a giant ship full of useless yellow metal... "
I wonder if we'll get map spoilers soon. Either way, I'm excited.